Four states have granted in-state tution to undocumented students, but the higher education pipeline continues to be plagued. This piece originally appeared in Generation Progress and is reposted here with permission. 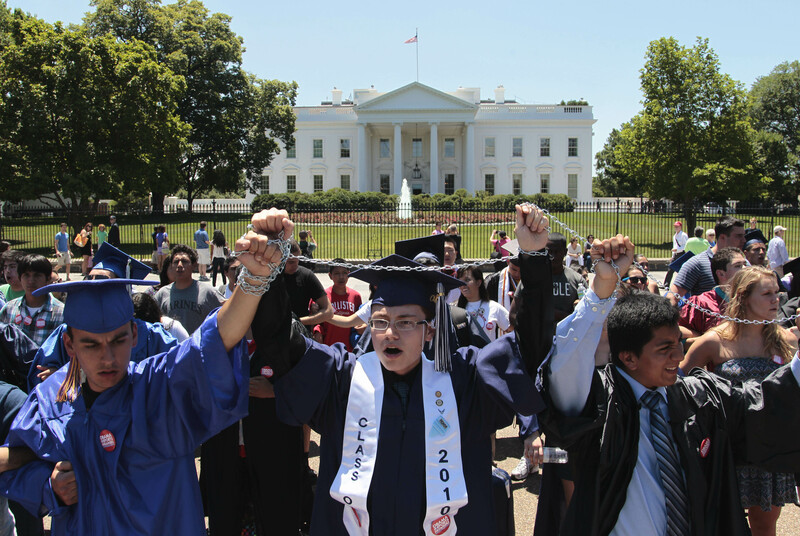 Amidst calls for Obama to end deportations and for Congress to pass comprehensive immigration reform, college access remains a prominent issue among immigrant rights activists. In the last six months, New Jersey, Washington, Florida and Virginia have granted in-state tuition to undocumented students. The focus of these wins have focused on DREAMers seeking an undergraduate education. In addition to access into colleges and universities, student affairs professionals are proactively providing retention resources to support DREAMers through to graduation. Programs at Arizona State University and UC, Berkeley, for instance, address the needs of current undocumented students through direct service and broader campus education. The higher education pipeline for undocumented students continues to be plagued with leaks. Approximately 65,000 undocumented students graduate from high school each year, and face severely limited opportunities to pursue a college degree. Currently, there are estimated to be about 13,000 undocumented students attending college. Hence, the movement for in-state tuition, financial aid and increased retention services is key for the success of those who are able to attend a college or university. However, missing from the mainstream analysis on educational equity for DREAMers are the stories of those attending graduate school. Recent stories of success include Sergio Garcia and Jirayut Lattivongskorn. Garcia attends law school, but was initially denied admission to the California bar. After a six-year legal struggle, the California Supreme Court ruling in 2014 finally made it possible for Garcia to fully access the benefits of his degree. Lattivongskorn will be the first undocumented student to attend the University of California, San Francisco for medical school. Graduate school offers opportunities for career advancement and greater financial earning over the lifetime. For many DREAMers who pursue higher education, empowering their communities is a key motivator. For Sofia Campos, a UCLA alumna and currently a graduate student at the Massachusetts Institute of Technology, her motivation to pursue a master’s in urban planning stems from her community. Fortunately for Campos, she had access to mentors and other undocumented students who had successfully navigated the graduate school application process. However, given the challenges that exist at the undergraduate level, graduate school may appear to be completely out of reach. Structural and resources issues lie at both the point of access, and within the university once undocumented students enter. Jude Paul DizonJude Paul Dizon covers immigration. He is a university administrator and teaches courses on social change, spoken word, and Asian American Studies. Follow Jude Paul on Twitter @judeiz0n.